It seems like on these dreary old mid-winter days (the ones with freezing rain, wind and no sun), a splash of colour is most needed. When that colour comes with a natural whiff of floral fragrance, it’s even nicer. 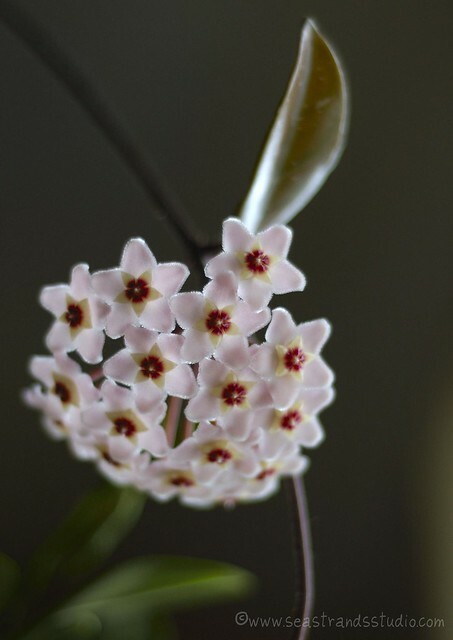 This Hoya plant was a cutting taken from the Devon House Clay Studio‘s Hoya and has been happily strangling co-existing with my orchids for several years. The first time it bloomed, the blossom was hidden by foliage so I was mystified by the powerful and strangely musky-sweet smell that only occurred at night in the kitchen. The culprit was located after I thoroughly cleaned everything and checked all the household nooks and crannies for rotting fruit.